Money has dominated the world for ages and we are getting obsessed with it that we are willing to do anything to let our hands grasp a few bucks. From farming to fishing to gambling to robbing, I dare to say we are ‘slaves’ of it and are proud to be one. I wonder what it is like to use the old barter system, where everything is placed on the ground at the market and people would trade their crops & fish with anything they need. Scale measurement didn’t exist and didn’t even matter; people bartered on the basis of mutual benefit and satisfaction. So if the world suddenly decides to abolish the monetary system and get back to bartering, what can I offer in exchange for something to eat? 1. Writing – becoming a blogger in Indonesia is quite easy when it comes to monetizing; you can develop your blog to a specific theme and would attract sponsors or companies to promote their brands in no time (well it takes some time, actually). So I can write nice things about you in exchange of bread and butter. 2. Teaching – shall I teach you some key communication skills in Business English or train your newly arrived puppy to go to the toilet? I’m very cheap. a month of rice supplies would be enough. 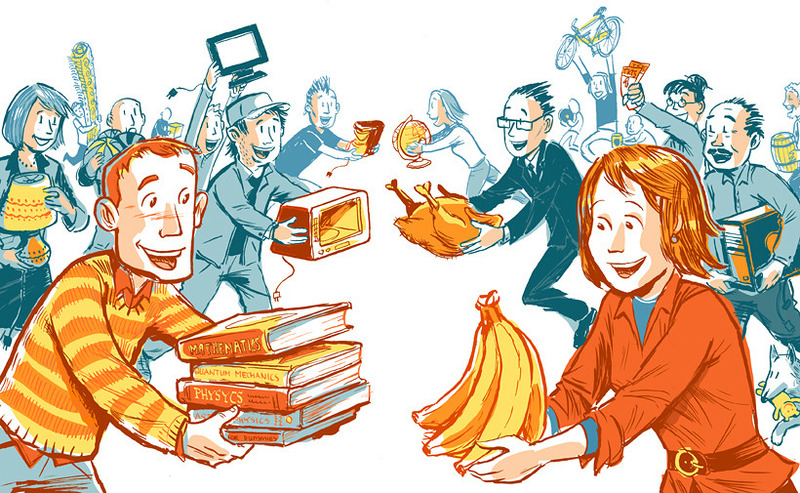 If you’re working at a school, barter could be part of rules of the event or the festival.